In partnership with the Yogyakarta Special Region, the Australia-Indonesia Centre is proud to bring musicians from the world-renowned Melbourne Symphony Orchestra to Indonesia to educate promising young players and conduct a historic performance at the ancient Prambanan Temple. This cultural exchange was cemented with a Memorandum of Understanding between the groups, signed by the Sultan of Yogyakarta, His Excellency Sri Sultan Hamengkubuwono X, and the Chairman of the Australia-Indonesia Centre, Mr Harold Mitchell AC in November 2015. 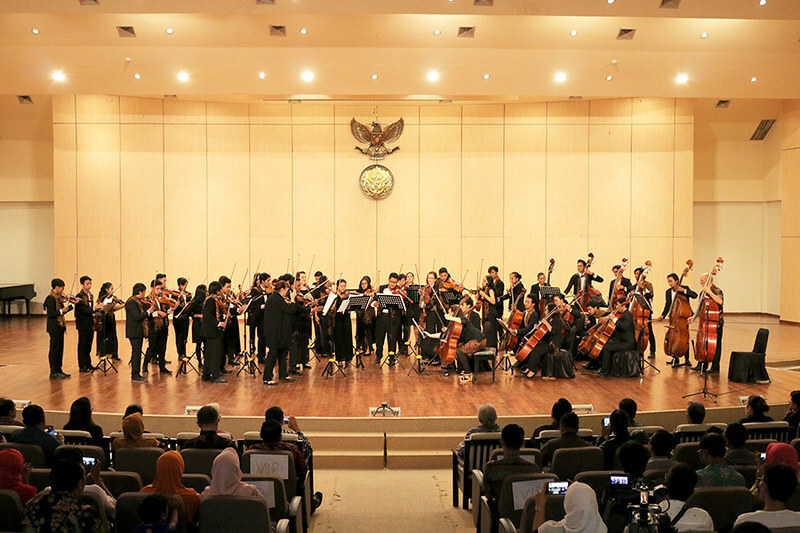 In October 2016, a seven member team from the MSO, including five string musicians, the Managing Director and the Operations Director, visited Yogyakarta to host a five-day music camp. Forty talented Indonesian music students engaged in workshops and rehearsals, culminating in a collaborative performance. The concert was attended by over 300 guests, including His Excellency, Hamengku Buwono X, the Sultan of Yogyakarta together with his family. This educational visit is a step towards the landmark event planned for March 2017, when the Melbourne Symphony Orchestra will perform at the World Heritage-listed Prambanan Temple.